OPC 43 Grade: The Ordinary Portland Cements is Superior compared to other mix and match cements. With modern instrumentation technology such as Electronic weigh feeders, Centralized control systems and one point control process, the product achieved is constant and superior. The cement produced is capable of building structures lasting for generations. Due to availability and usage of high CaO content limestone around the manufacturing facility, the cement produced naturally carries these vital minerals resulting in optimum physical strength and chemical characteristics. 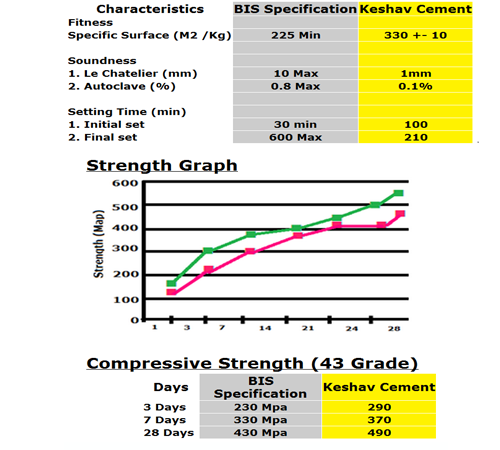 PPC Grade: Fly Ash has very small particles which makes the concrete highly dense and reduces the permeability of concrete. It can add greater strength to the building. The concrete mixture generates a very low heat of hydration which prevents thermal cracking. PPC cement appears to be natural selection for majority of the Engineers due to underlying technical reasons. Quality: Quality is achieved not just because of best machinery, but the men and women who dedicate with best efforts. SKCIL is proud to have dedicated and very loyal associates who work in a team to achieve our common mission of 100% Quality and 100% Customer Satisfaction. 2. Concrete Slabs, Foundation and Walls. 3. For Dams, Canals, Bridges, Concrete Roads and other Public utilities. 4. All purpose in High rise buildings.